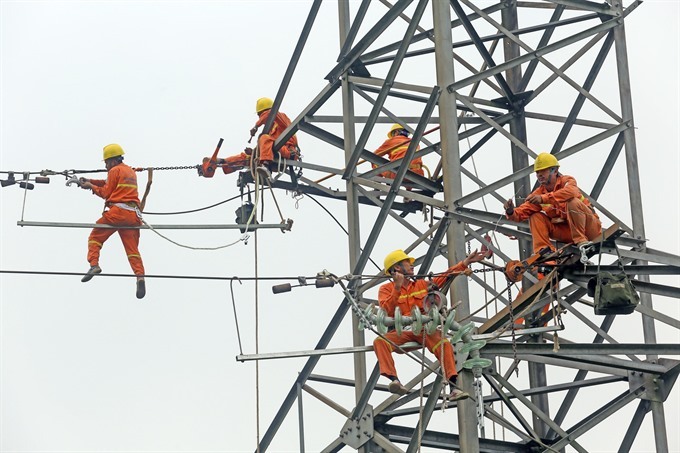 HÀ NỘI — Việt Nam has embarked on the process of liberalising the power sector, in the hopes of easing electricity shortages, attracting more investment and boosting economic growth. The Government has lined up a series of sizable initial public offerings (IPOs) of major power corporations, including PV Power, EVN Generation Corporation Number 3 (Genco 3) and Bình Sơn Refining and Petrochemical Company Limited (BSR). Việt Nam is forecast to suffer an electricity shortage in the next four years as the installed capacity growth is estimated to range from 4.6 per cent to 10 per cent per annum during the 2017-21 period, lower than the projected 10-11 per cent annual growth in electricity consumption over the next four years. Electricity consumption, which grew 12 per cent per year from 2006-16, will likely pick up in the coming years given that the foreign direct investment (FDI) into the manufacturing sector, which accounts for 50 per cent of total electricity consumption, has doubled over the past four years to reach US$63.1 billion. The revised Power Development Plan VII, released in March 2016, anticipated electricity consumption reaching 235-245 billion kWh by 2020 and 506-559 billion kWh by 2030, with the assumption of 7 per cent annual GDP growth. This figure in the first half of this year was some 84.1 billion kWh, up 10.05 per cent year-on-year. The Government’s plan to liberalise electricity, along with the high market demand, make the power sector appealing to foreign investment. “Việt Nam’s power sector holds tremendous potential, whether in its more traditional forms such as thermal or hydro, or renewables like wind and solar. The country’s continued development depends on having the electricity to power it,” Don Lam, CEO of VinaCapital told Việt Nam News. The Government plans to reduce its holdings in power companies to 51 per cent. The remaining stakes will be offered to strategic investors and put up on public sale. PV Power plans to auction a 20 per cent stake through its IPO scheduled in December and 28.8 per cent of shares will be sold to strategic investors. The Government will likely remain its majority stakeholder until 2019. PV Power is the second-largest electricity producer in Việt Nam, after EVN. It manages plants with total capacity of 4,208MW. Last year, the company’s plants generated 21 billion kWh of electricity output. Meanwhile, the equitisation plan of Genco 3 is awaiting Government approval. Bình Sơn Refining and Petrochemical has postponed its IPO, in which it planned to sell a 5-per-cent stake, until next year in order to ask permission to sell a bigger stake. “The equitisation of State-owned enterprises is positive. IPOs generate much-needed capital for the Government, while private strategic investors can often bring valuable experience in addition to funds,” Don Lam said. According to Nguyễn Xuân Bình, chief economist and market strategist at Bảo Việt Securities Joint Stock Company, IPOs of big power companies will likely draw attention from foreign investors, especially investment funds, given their stable operations and appealing growth prospects. “The most important factors to attract big investors are the selling price and the proportion of stake put up on sale,” Bình said. He pointed out that some past IPOs failed because of the tiny size of the share sales, less than 5 per cent. Regarding the involvement of strategic investors in the company’s decision-making after equitisation, Bình said the State still holds the dominant stake and strategic investors may only contribute their governance know-how and opinions on development plans. To fund its capacity building, the Government has allowed more foreign investors to participate in the power sector through BOT projects such as Nghi Sơn 2, Nam Định 1 coal-powered plants, leading to a strong FDI flow into the sector in recent years. However, foreign investment into new energy projects is far below the need for capital in the energy sector. A number of factors have contributed to sluggish foreign investment, including the time and complexity to receive necessary approval for new projects and site clearance. “I think there needs to be a new approach, namely one where the operating energy assets of today are sold to investors so that the Government (or the equitised energy companies) can build the generating assets of tomorrow,” Don Lam suggested. He said foreign investors are looking for reasonable returns over a defined period of time. They have the capital and operational expertise to make power plants more efficient. Meanwhile, the equitised companies have the capability to deal with the complex process of regulatory approvals and other bureaucracy in Việt Nam. From the production side, a sector report of the Viet Dragon Securities JSC said the wholesale competitive market, expected to go into operation in 2019, will benefit most power plants, especially low-cost generators such as hydropower plants, while wholesale buyers may make cash payments to power producers.